Today I want to talk to you guys about eczema. 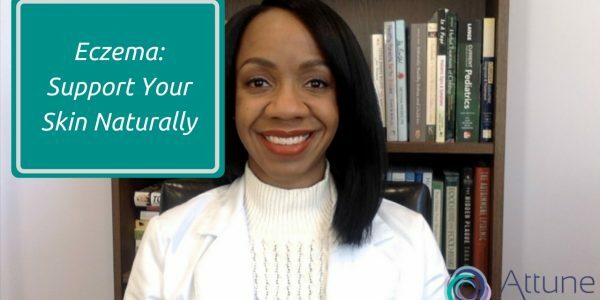 Because it’s by far one of the most common conditions that I see in my practice and there is so much that you can do naturally to support the health of your skin. Disclaimer: This article is for informational purposes only and is not a substitute for the professional advice of your physician or other licensed health care provider. Never avoid, disregard or delay seeking professional medical advice, or change any of your prescribed medical treatments because of something you have read on this blog. If you try any therapies or recommendations discussed on this blog, you do so at your own risk. Are you struggling with your health? Our clinic proudly serves the Boulder and Denver, Colorado metro areas including Broomfield, Louisville, Lafayette, Arvada, Thornton and Westminster. Schedule a complimentary 10-minute phone consultation to find out how we may be able to help you. Attune Functional Medicine is a participant in the Amazon Services LLC Associates Program, an affiliate advertising program designed to provide a means for sites to earn advertising fees by advertising and linking to amazon.com. © 2018 All Rights Reserved By Attune Functional Medicine LLC.